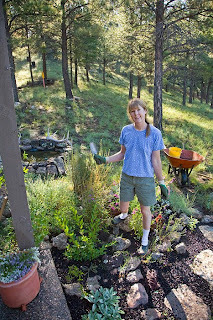 Gardens on the outskirts of Flagstaff are patient and persistent teachers. Most of them eventually manage to educate even the most stubborn of gardeners about how to cooperate with the local climate and just how little they can boss around nature. Where we live is not only a biological ecotone, it's also something of a cultural ecotone between human beings and the natural world. We have learned from our garden that what will grow here is definitely not up to us. The plants will mostly determine that for themselves, in collusion with butterflies and chipmunks in the daytime and moths and rabbits at dusk. Even the inanimate — the sun and the soil, the wind and the rain — have a much stronger voice than do we. At first we tried planting what we wanted, based on what we found at nurseries and in catalogs. We put in cosmos, for instance, but chipmunks and ground squirrels ate them all immediately. Pansies and petunias met the same fate. Sudden frosts blackened most nursery stock and dry winds shriveled transplants grown in distant, muggy greenhouses. The only plants that thrived in those early days were the ones whose seeds arrived in our garden via the wind or the alimentary systems of birds: alpine pennycress and silverweed cinquefoil, MacDougal verbena and common yarrow, pussytoes and pygmy bluets, wild sunflowers and Flagstaff senecio with its rosette of leaves and single yellow flower on a stalk. Noticing where these locals established themselves, we finally learned where to put the native—or at least hardy and drought-tolerant—plants we brought home from a nursery. We stopped dotting them around the house in naked patches of dirt. 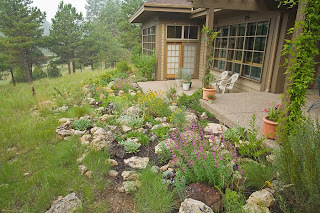 Instead we planted perennials beside football-sized rocks that would keep them warm, shield them from the wind, and hold moisture in the soil to sustain them between rains. Seeing that new plants did best near established plants, we grouped them together to form mutually-nurturing neighborhoods that shelter each other’s seedlings and attract hordes of ecstatic pollinators. The house itself became part of the garden, fostering mosses and moisture-loving plants on its shady north side, and agaves and other drought-tolerant plants on its sunny south. In the early years, it sometimes felt as though we were in an endless struggle with marauding rodents and harsh elements, which foiled our attempts to establish plants we wanted just where we wanted them. We squandered time, effort, and expense before we learned to observe what was already here and the character of each plant and place in each season. It was when we finally let the garden have its own way that the struggle ceased. Our garden taught us to cooperate with what naturally occurs and to offer only gentle encouragement. In our case, this meant providing sheltered niches in appropriate spots for plants both wild and bought. After that, voila! Our garden’s evolution into flowering mounds, mats, and spikes began. We are patient now, recognizing that the garden goes through different stages in concert with its pollinators and pruners, from its small and shy early bloomers to its dazzling summer crescendo. Shrubs leaf out and perennials emerge as if by magic each spring. Pollinators from beetles to bees to hummingbirds arrive as their preferred flowers open in sequence from April through October. Ripe asters attract lesser goldfinches and other birds which bob up and down as they pluck at the seedheads, dropping a few to germinate next year. Golden-mantled ground squirrels harvest the fescue, leaving it to dry in the sun then storing it like hay. In winter, rabbits nibble shrubs poking above the snow, neatly and naturally pruning them back. Elk and mule deer mysteriously keep their distance (much to our relief) but coyotes, fox, and an occasional weasel do their bit to keep things in balance as they prowl at night around the house. On our land, there is no question that nature is the Master Gardener. 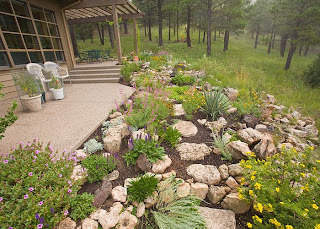 Susan Lamb, a local writer and naturalist (www.susanlamb.net), and her husband, Tom Bean, a photographer, won the Best Native Plant Garden award of the Arizona Native Plant Society in 2008. 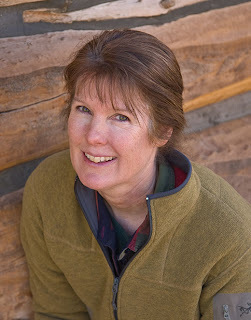 She is the author of The Natural World of Saint Francis of Assisi and Arizona's Scenic Seasons.